Explanation: Although the phase of this moon might appear familiar, the moon itself might not. In fact, this gibbous phase shows part of Jupiter's moon Europa. The robot spacecraft Galileo captured this image mosaic during its mission orbiting Jupiter from 1995 - 2003. Visible are plains of bright ice, cracks that run to the horizon, and dark patches that likely contain both ice and dirt. Raised terrain is particularly apparent near the terminator, where it casts shadows. 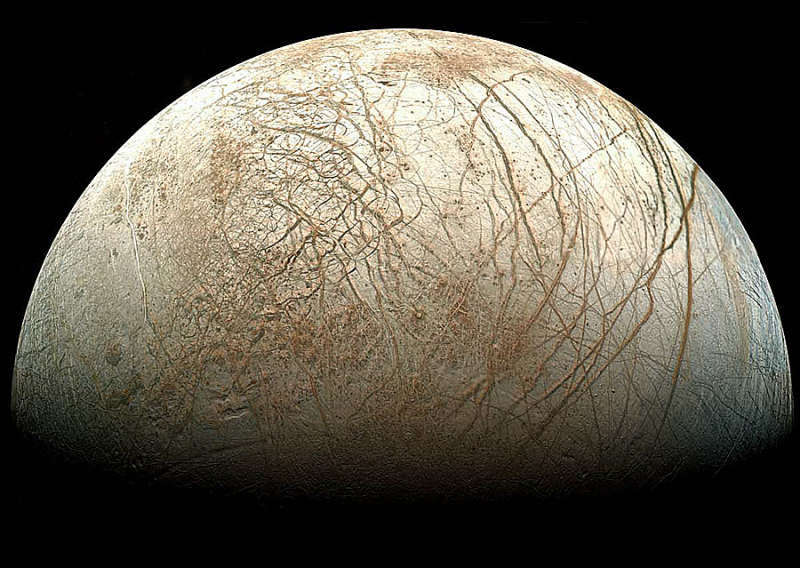 Europa is nearly the same size as Earth's Moon, but much smoother, showing few highlands or large impact craters. Evidence and images from the Galileo spacecraft, indicated that liquid oceans might exist below the icy surface. To test speculation that these seas hold life, NASA and ESA have started preliminary development of the Europa Jupiter System Mission, a spacecraft proposed for launch around 2020 that would further explore Jupiter and in particular Europa. If the surface ice is thin enough, a future mission might drop hydrobots to burrow into the oceans and search for life.